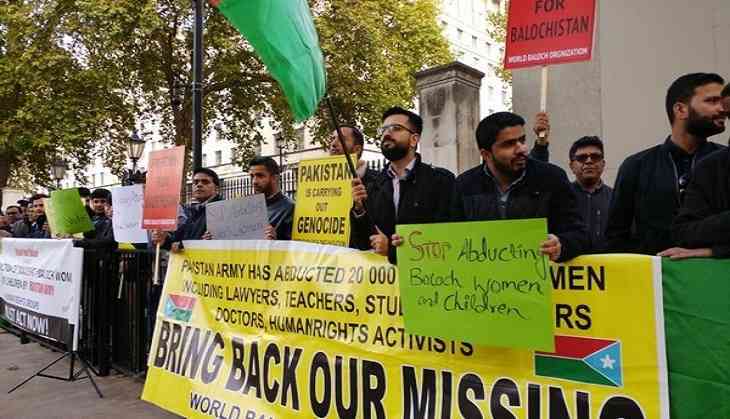 An anti-Pakistan protest was held by Baloch parties at 10 Downing street in London against abduction of women and children in Balochistan on Sunday. World Baloch Organisation (WBO), Baloch National Movement (BNM), Baloch Students' Organisation-Azad (BSO-A) and World Sindhi Congress (WSC) took part in the protest and highlighted gross human rights violations committed in Balochistan by Pakistan. The protesters were seen carrying banners and placards, urging rights groups to act against Pakistan for carrying out atrocities over Baloch people. "Raise your voice against the abduction of innocent Baloch women and children by Pakistan army," a banner read. Protesters shouted slogans with placards in their hands that read: "Pakistan carrying genocide" and "stop abducting Baloch women and children." Last week, a Washington-based organisation urged international bodies to help set free an abducted Baloch leader's wife and daughter from the captivity of Pakistani security forces. Washington-based American Friends of Balochistan (AFB) has appealed to the United Nations, US State Department, Amnesty International, Human Rights Watch, UNICEF, International Service for Human Rights and other international bodies to step in to free four women and three babies from the illegal captivity of the Pakistan security forces. Fazila Baloch, wife of Balochistan freedom leader Dr. Allah Nazar Baloch and his adopted daughter Popal Jan, four; Fazila's friend Bibi Salma and her one-and-half years old son named Irfan; Ayaal and her two-years-old daughter Zairak and a fourth woman Gohar Jan, were abducted on October 30 from Quetta. At least 8,000 Baloch are still victims of enforced disappearances in Balochistan while 1500 such victims were killed and dumped, according to human rights organisations.